I love this Bruschetta. It’s delicious as an appetizer over toast, but I also love it with chicken. I usually make it ahead of time, put it in the fridge and let the flavors marinate. Then, I either use it on toasted baguette slices or on top of a simple, grilled piece of chicken or fish. It’s similar to my Salmon Done Simply in Foil recipe. This has a delicious, fresh taste and will last at least a few days (probably three) in the fridge. Now that the weather is getting warmer, this is such a wonderful, light dish using tomatoes, which I love.This evening I used a grill pan on the stove with a little olive oil in pan, kosher salt and freshly ground black pepper on paper thin chicken breasts and just grilled a few minutes on each side and they were perfect with tomatoes on top. 2 pints grape tomatoes (I like to mix yellow and red ) and of course you can use heirloom when they’re in season or any fresh tomatoes. I cut the tomatoes in half lengthwise, or just into small pieces )I actually was able to obtain cherry heirloom tomatoes, and I cut them into small pieces. fresh basil (about 16 leaves), cut up in chiffonade style (just roll basil and take a kitchen scissor and cut it up; you can also just chop it up) * I actually forgot to buy the basil this time but usually I do put it in, it adds a great deal of flavor. In a small skillet, heat olive oil over medium high heat. Add the garlic and lightly stir it around for a minute or so. Don’t brown the garlic–just warm it up to a golden color, what I actually do is heat the olive oil and when it’s hot remove from stove then put the chopped garlic in and let it turn a golden color off the heat. Pour into a bowl and allow it to cool down. 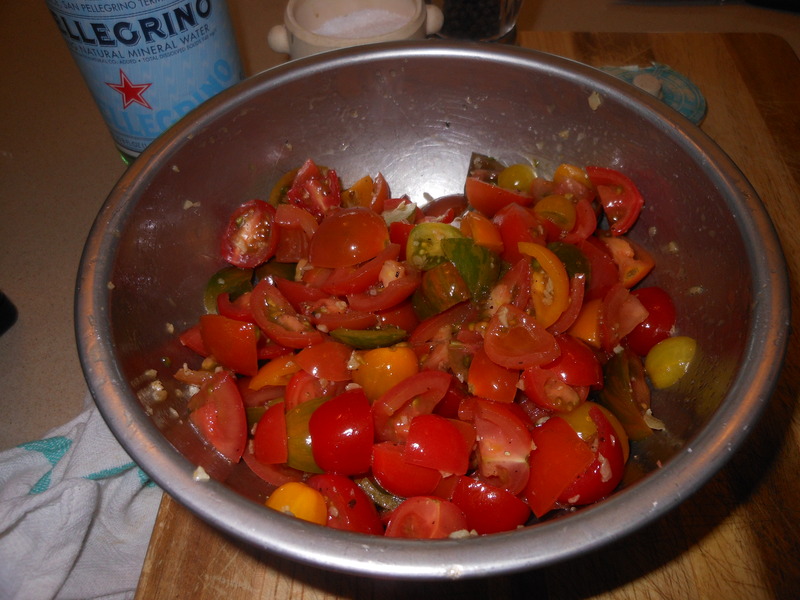 Add the tomatoes, balsamic, salt and pepper (to taste). Be careful not to over-salt–just put a little in and stir it; you’ll be able to check salt and pepper again later. Cover and refrigerate for at least an hour. Obviously the longer it sits, the better it will taste. When you take the mixture out of the fridge, stir the tomatoes and now taste again for salt and pepper. Spoon bruschetta over the sliced bread, and serve on a large platter. This is a perfect substitution for a salad. If you’re serving over chicken or fish it’s just simply divine. I simply put a little olive oil on chicken cutlets sprinkle with kosher salt and freshly ground pepper and use a grill pan on stove or throw on the grill outside. If I am serving over bread, I slice the baguette on the diagonal. Take a little softened butter ( melted butter) and brush on top of bread, then put in oven on a baking sheet to toast until golden and then repeat on the other side. You can also brush with a little olive oil (you just don’t want the toast too dry). If you’d like, you can also put toast on outdoor grill to get grill marks. This entry was posted in appetizers, Salad, sides, vegetables, vegetarian and tagged Bruschetta over Toast or Fish/Chicken, Tomato Bruschetta with or without chicken, Tomatoe Bruschetta, Tomatoes. Bookmark the permalink. Re-blog Monday and recovering from all the Mother’s Day Festivities. 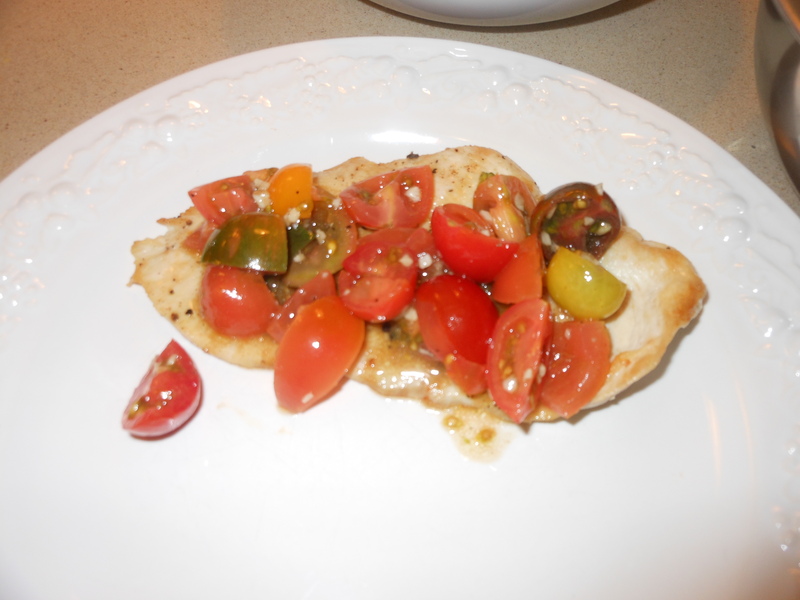 This is a delicious Bruschetta served over chicken/fish or just as a side salad. If you’re lucky enough to get these beautiful heirloom tomatoes then go for it. If not just little plum or cherry tomatoes will work just fine. This is a great staple for the summer. Original Post was April ’12. Enjoy and hope you all had a wonderful Mother’s Day. I’ll be trying this once my garden gets fired up! I bet grilling the tomatoes first would also be supreme!